L’Observateur can conduct various types of surveys on your target or client groups. The quantitative surveys allow the measurement of different phenomena and behaviours of a given population. 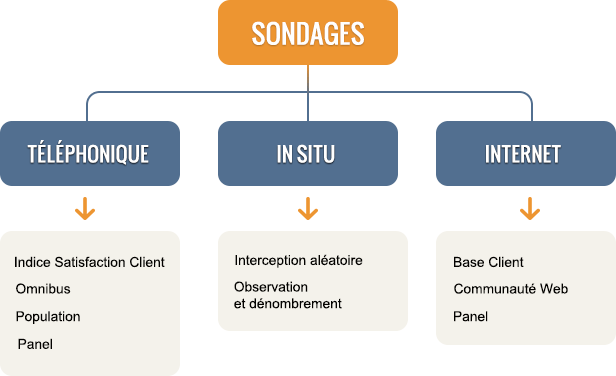 Whether they are made from the call center of L’OBSERVATEUR, on the internet through its web community or in person, quantitative surveys will enable you to identify the major undercurrents of a particular problem. The quantitative surveys are a tool of choice for many studies, both of public opinions, satisfaction, consumer behaviours, the reputation of an organization or brand, etc. Our data collection is constantly monitored by field supervisors. Computer processing is performed by a qualified team that mainly uses proprietary software packages. Qualitative surveys are studies that rely more on discussion rather than direct questioning. Taking mostly the form of focus groups, qualitative studies aim to identify the behaviours, motivations, opinions and judgments of consumers in group dynamic situations. For fruitful discussion groups, real consumers are invited to exchange and express their views. Our experienced facilitators accompany them to establish a comfortable atmosphere that will promote the attainment of high quality information. Our qualitative research will help you discover the strengths and weaknesses of the advertisements, products or services that you would like to market.